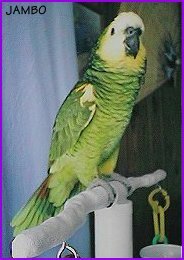 JAMBO is my male Blue-fronted Amazon. He hatched on 5/11/95 and came home with me in July of that year. 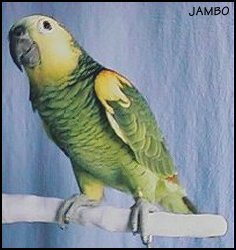 Jambo is typical of most Amazon species. These amazing parrots are not only great talkers, but talented singers as well. Jambo spends most of his day singing the children's songs he's learned, and even re-writing the lyrics! "Old MacDonald" is now "Old MacJambo"... at least in Jambo's world it is. Like most Amazons, he can be a little feisty at times. Depending on his mood, you might get a nip or a kiss. Because of this tendency to be somewhat unpredictable, it's important for the owner to be "in charge" of the bird, and not the other way around. Jambo's not the "cuddly" type, though he will tolerate a few head scratches if it suits him. Amazons are intelligent, talented, silly and just plain FUN to be around. My little Jambo sure is! "Oh! Jambo gave Mommy a kiss!" "Sing me a song, Jam." "Jam's a good boy... what a good, good boy!" 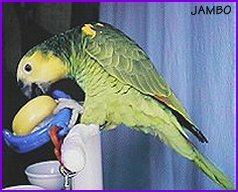 As pets, Amazons are among the most popular parrot species because of their intelligence, colorful beauty and good talking ability. 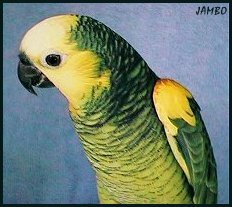 A sexually mature bird can display nippy behavior during breeding season, but this is a small price to pay considering the over-all picture of an Amazon as a pet. Their outgoing personality lends a dramatic, humorous side to their charm. They love being the center of attention and usually will "show off" even in front of strangers. Because of their excitable nature, Amazons can be quite loud at times, though they certainly don't have the ear-piercing screams that a Cockatoo can produce. Nevertheless, be prepared for some noisy moments in your day if you own one of these gems! Amazons can live to around 75 years old, given the proper care and diet.